Black Ice Software - Print2RDP version 6.12 is released! Improved RDP connection detection, improved installation and logging! Black Ice Software has released version 6.12 of the Print2RDP. This version includes greatly improved RDP connection detection while adding or removing printers in the Print2RDP. This new feature helps the user to mount the printers more smoothly. 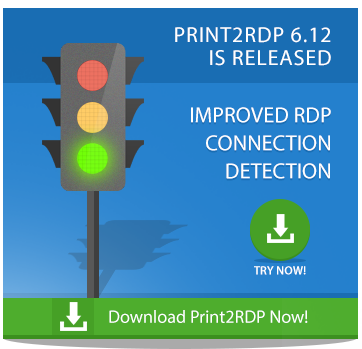 The Print2RDP version 6.12 includes new design for the installation and uninstallation and also includes minor improvements on the Print2RDP user interface to enhance user's experience. Version 6.12 of the Print2RDP includes extended logging, to let administrators and system integrators identify and troubleshoot the occurring issues.